a ska loving geek: new ink! 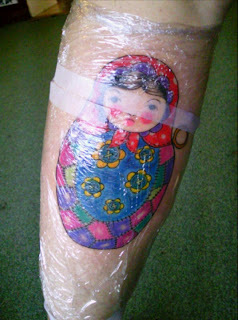 this is my new little lady, on the back of my left calf. For those non dolly people, the thing on the right is a Blythe pull ring. Today my leg is vey swollen and sore. seems to have bruised a lot this time. Is that cling film? Does it help with the swelling? sorry, I don't have tattoos so I have no idea about these things!